Today's legal library must be well prepared, multi-functional, space efficient and have an professional aesthetic appeal that blends well with any office environment. Our shelving is designed to be durable, flexible and attractive. Tough, double-wall construction protects stored materials and provides a "clean" corporate appearance. Franklin Mills case-style shelving is the system of choice for professionally designed legal libraries. Offering incredible flexibility, you will be pleased with the ease with which our bookcase shelving adapts to any application. Click here to view our case-style shelving brochure. The overbend design of the shelf lip hides shelf supports while the double wall construction of its uprights conceals keyhole slots to present a clean, attractive appearance that complements any library decor. The flush interior to the end panel also prevents books from slipping behind uprights obscuring the titles. Utilizing a unique interlocking keyhole slot design, shelf supports are secured to the inside wall, leaving a smooth clean appearance. It�s strong and rigid construction carries even the heaviest of book collections safely. Franklin Mills also features a line of elegant wood-clad library shelving. Custom work surfaces can be added to compliment any interior design. A full range of accessories are available to meet every functional requirement. Easy assembly: No nuts or bolts are needed. Can be quickly installed, expanded or relocated. Strength and durability: Our systems feature the strength of cold-rolled steel with gauge thickness that meets or exceeds U.S. Standards. Aesthetics: Our systems are an attractive addition to any office environment. All our shelving products feature a high-quality powder coat finish that resists abrasion. Franklin Mills can match paint colors to request. Flexibility/adjustability: By simply connecting additional uprights and shelves to your existing installation, you can meet your growing needs easily without tools. Individual shelves can also be adjusted easily as well, usually without disrupting shelves above or below. Value: Case Style construction offers a cost savings of up to 40% over cantilever shelving. Plus, valuable vertical space is gained over this type of shelving by eliminating the need for wider bottom base to balance the unit. Case style looks and works like 4-post but, with a couple of important differences. All Case Style uprights are closed and include a second steel panel, welded into the inside of each upright. This second steel panel not only strengthens the upright but, acts as a top-to-bottom filler piece which naturally prevents books from creeping behind corner posts. This eliminates the need for end of shelf dividers. Case Style file shelving costs about the same as 4-Post (with the extra dividers) but is stronger and much more attractive. Case Style works well in medical and corporate libraries (also known as "special libraries") where magazine type journals and periodicals make up the lion�s share reference material. Binders also store well in Case Style shelving. In each of these cases the media is of consistent size and once shelf spacing is set, few changes will be needed. Franklin Mills also features a line of elegant wood-clad library shelving. Custom work surfaces can be added to compliment any interior design. A full range of accessories are available to meet every functional requirement. 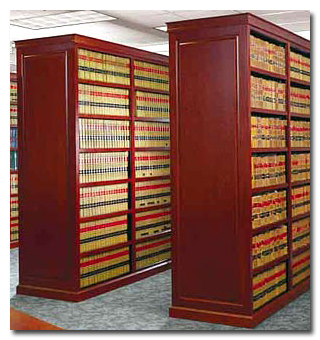 Contact the experts at Franklin Mills to discuss bookcase style shelving for your legal practice at 1-888-678-4585.